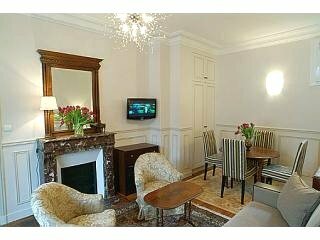 Part One: links to itineraries of our trips in more detail with reviews of sights, hotels and restaurants we enjoyed. Part Two: helpful facts on airport, car rental & train. You can fly directly to southern France from Paris and European cities which saves a lot of time (see... 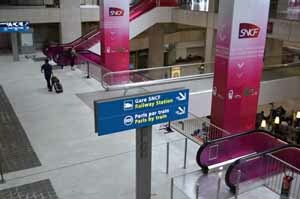 Airports in France), or you can take the TGV high speed train. Sometimes flights cost less than the train. In 3 days you can see Paris and from there travel to other French Regions. Brittany to the Dordgone via train travel is into the city of Bordeaux. 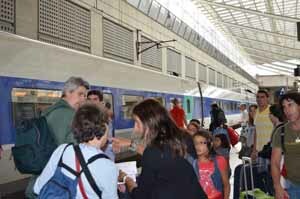 At the Bordeaux train station you can rent a car and drive to the Dordogne. You see more if you have a car in this stunning rural area. This first day started with 11 hours of air travel to France with one of the daily Delta/Air France flights from California where we live, to Paris Charles de Gaulle airport. Needless to say we were very tired when we alighted on French soil. One of first things we did was make our way to the SNCF TGV train station located in Terminal 2 (convenient since that was the terminal where we arrived) to buy our TGV train tickets to Rennes in Brittany. If you live in the US and want to get your ticket before you go to France you purchase them through Rail Europe. You can buy a France Railpass for unlimited rides, or just one ride. You can also get a France Rail n' Drive which includes train pass and car rental. If you are comfortable waiting until you get there you can save money by buying them at the SNCF train station ticket counter. France trains are a fast and convenient way to travel. Much easier than driving in France the minute you step off the plane. 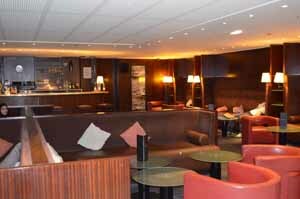 Since our train would not leave for an hour we went to the Sheraton Paris airport hotel directly upstairs from the train station and sat in the lounge/bar area and had tea. Very pleasant and I highly recommend. I think you can even sit in the lobby if you don’t want anything to eat or drink. The TGV to Rennes was ok but we were in seats facing other travelers and it felt cramped. When you buy your train tickets if you are 2, always ask for seats by themselves. Got the car from Hertz, a 4 door Opel Corsa. An economy car, not a lot of power but perfect for 2 people with room in the back seat to throw stuff. We reserved it on the Hertz website. Fantastic service and cheaper than Europcar. Driving in France is easy and necessary if you are visiting rural areas and want to explore the countryside. We drove our jet lagged selves to the small village of Malguenac in the South of Brittany to stay with our Cousins Paul and Marie-Paul. This is the hometown of my father-in-law and full of family and old friends. Even visited some that night but I have to say I was dragging with fatigue. We had dinner at the local creperie (where everyone knows everyone and stops to say hello). So good to eat crepes in Brittany, where they originated. After that, we plonked into bed! Learn why Brittany France is one of my favorite places in France!